The Bavaria 34, with low displacement is an easy boat to handle in areas of high tides and current. The interior is designed with an emphasis on spacious dining. Galley size has been sacrificed slightly to give a large dining area with opposing straight settees. 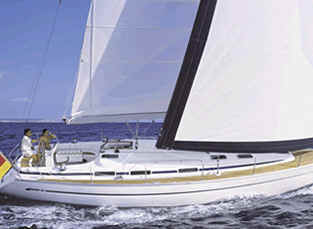 The Bavaria 34 is available in the 2 or 3 cabin model. 25% DISCOUNT APPLIES TO LAST MINUTE BOOKINGS. The Bavaria 34 comes in the two or three cabin version. Each cabin can comfortably accommodate two people in double berths. The salon settee can accommodated two more if required. Both Bavaria 34's have one head with a hot and cold water shower. The Bavaria 34 has furling sails, roller reefing, one wheel steering, VHS, depth sounder and an electric anchor winch. There is a bimini and dodger, an ondeck shower, dinghy, CD player, fully equipped galley with LPG stove & oven, electric fridge, and full boat briefing.